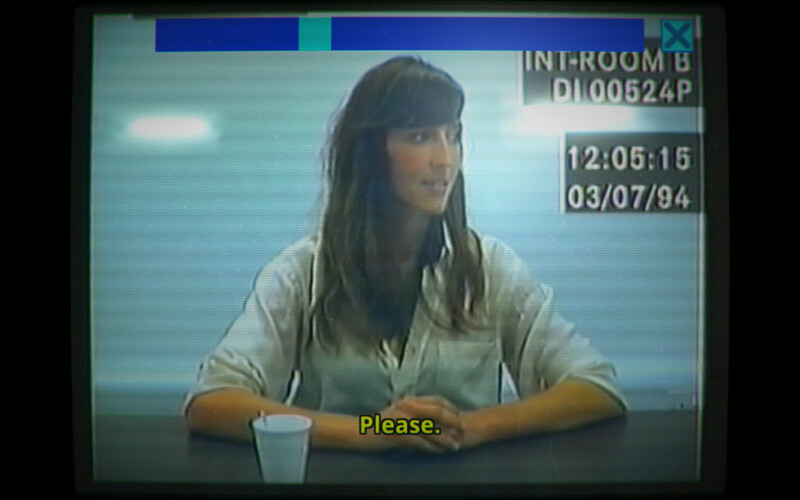 Her Story is an indie game (meaning it was not released by a mainstream publisher) released in June of 2015. It is described by creator Sam Barlow on the game’s website: “A crime fiction game with nonlinear storytelling, Her Story revolves around a police database full of live action video footage.” Actress Viva Seifert plays a woman who is interrogated by police detectives on seven separate occasions concerning the mysterious disappearance of her husband. This game is fascinating. I found it to be a lot of fun, and I didn’t have to put in a whole lot of time. Upon launching the game, you are given nothing but the police database, with the police station’s desktop beneath it. On the desktop is a readme file that gives you a bit of the setup for why you are here, and a second readme file that gives you guidelines to begin your search. Intrigued, and not at all sure what I was doing, I started with the word already plugged into the search bar. Four videos appeared. So I watched them in order, “saved” them to my “session,” and began plugging in words that stuck out to me from the interrogation clips. The further along I went, the more I began to piece things together. This is a “true detective” game where you are trying to find the answers to questions you aren’t sure you have until you begin. While going through the video clips, I suddenly realized I was searching for answer to questions I hadn’t fully realized had formed. “What really happened? Why? Who did it?” I had burning questions that I desperately wanted to answer. There comes a point in the game in which your detective friend, who is apparently the one to have gotten you access to the database, asks if you understand. It gives you the option to answer “yes” and finish the game, or “no” and continue searching for videos. Once you finish, watch the end credits, and you will be given a hint that will allow you to continue searching with more ease. I highly recommend you do this, as you can go for a completion run and find all the videos you may have missed the first time around. It is absolutely worth it. Viva Seifert is wonderful. I have to admit that I don’t know much about her outside of this game, but she is absolutely brilliant in Her Story. I can’t say too much without giving anything important away, but her performance is riveting, and well worth the $3.00 I paid for the game. Honestly, I would probably pay the $6.00 as it is currently priced on Steam and feel it is worth it. Why I Like This Game: I love mysteries, and I love puzzles. I enjoy learning pieces of information and trying to piece them together to get to the truth. Add all of that into a well-put-together game with superb acting, and I’m sold. Why You Should Give This Game a Shot: For those of you Janes who may be looking for an easy game to pass the time with, or who may be looking for a story, or who like mysteries, this is the game for you. I played this one chilly night, curled up on the couch with my Surface and a cup of hot chocolate and a blanket. It was a very satisfying night. This game is available on Steam - perfect for laptops - and on iPhones and iPads. It is easy to pick up and put down, which means you can fit it in whenever you want or have the time. It took me about an hour and a half to two hours to complete my initial run. My full run took me about four hours. It is rated 9/10 on Steam, 4.5/5 on Metacritic, and 8.5/10 on IGN.com.